I’ve noticed a lot of food world mutterings of late about the merits and pitfalls of SALT. Is it the enemy of healthy blood pressure and accomplice to the fast food industry? Or is it the perfect replenishment following a hard workout, not to mention a chef’s magic dust that makes food go from bland to ‘Bam!’ (in the words of the first food celebrity)? I read this NY Times article last month about how salt isn’t as bad as we (the government’s dietary guidelines, mainly) have made it out to be over recent decades. The gist is they had basically taken scant science that may or may not mean salt is bad for certain people with certain predispositions and run with it, spreading the word to educate the masses on the dangers of salt. So I already had salt on the brain when I heard this odd radio ad the other day. It starts with a series of Jeopardy-like questions touting all the diverse benefits of what it tells you at the end is… drumroll… salt? 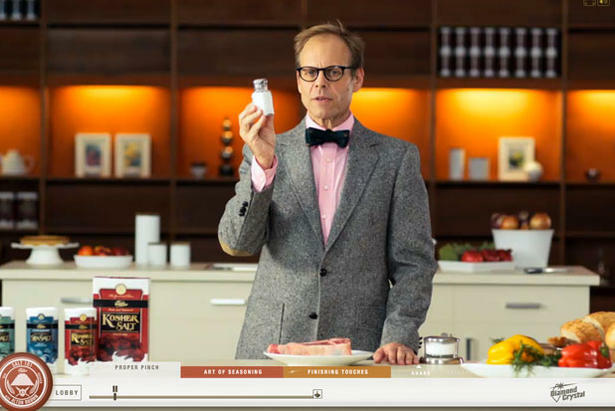 Alton Brown touting salt’s cooking lore in a much criticized campaign for Cargill, according to Mark Bittman’s blog: http://markbittman.com/the-fight-over-salt-big-food-vs-us. What makes food taste better? Roads safer? Bodies stronger? Clothes cleaner? Then the punch line: “Guess it’s true what they say, ‘Everything’s better with a little salt. '” The first time I heard it, I was simply proud I had figured out the compound by the second clue. The second time, I thought, “Who on earth is promoting salt? 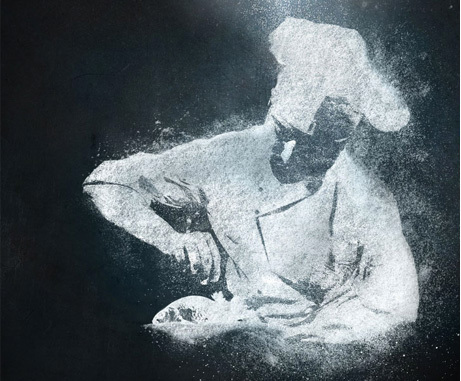 Does salt really need a PR agency and ad campaign?” Apparently so. I did some googling. The radio ad sent me to alittlesalt.org, a site that emphasizes the same salt features as the ad, complete with a video. There are tabs on each of salt’s touted benefits (although I must mention that, according to the Bible, salt has many other applications). The artsy picture of salt’s cooking benefits featured in the ALittleSalt.org campaign. The salt site has neat graphics and such, but only offers tidbits of information about what makes salt so special, along with options for “sharing” the info via social media, of course… all clues that it’s linked to some sort of PR effort. Why not dig into the science and tell me all about salt, how it does what it does? Maybe because I’m one of the few people who would read it? Turns out the salt site is linked to The Salt Institute, which offers far more information about the incredi-compound. … a North American based non-profit trade association dedicated to advancing the many benefits of salt, particularly to ensure winter roadway safety, quality water and healthy nutrition. Salt is the most common and readily available nonmetallic mineral in the world; it is so abundant, accurate estimates of salt reserves are unavailable. In the United States there are an estimated 55 trillion metric tons. Since the world uses 240 million tons of salt a year, U.S. reserves alone could sustain our needs for 100,000 years. The U.S. and China dominate in world salt production, combining for 40% of the world’s quarter billion tons of salt produced each year. Who knew? I mean, I know every industry and agricultural product needs a trade group, but I guess I had left condiments and spices out of that category. That was a mistake. Salt and its precarious reputation are linked to some behemoths of agricultural production in the U.S., like Cargill and Morton Salt. The Institute’s corporate backers are listed on its site here. Salt, as they assert, is far more than something to dash about your dinner. It saves lives people (unless you live in Seattle, where salting the roadways is considered polluting the Puget Sound — which is salt water… never got that one — so they just let all the Priuses careen around on the ice in the winter). So with all the salt critics out there — including, at times, the ever changing food pyramid/food plate/whatever they’re into these days — it appears salt does need an ambassador… or at least someone to make sure people keep buying it. And I thought the judges on Food Network’s Chopped were obsessed with salt (Come to think of it, The Salt Institute should hire Alex Guarnaschelli for her constant “I could use a bit more salt” line). work and coverage! Keep up the superb works guys I’ve added you guys to our blogroll.